Someone voted to close my question for a reason that I do not understand. 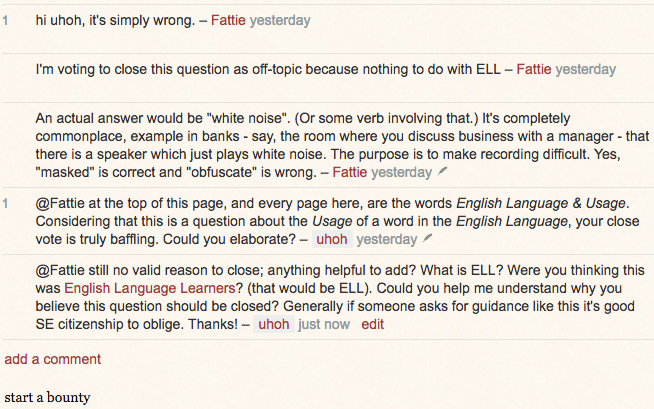 It looks to be a straightforward question about the usage of word in the English language. What would be the reason for these accumulating votes to close because it "does not appear to be about English language and usage within the scope defined in the help center." My question seems to be well received, has generated positive discussion and two thoughtful answers that have both been well received as well. In fact, the two answers disagree with each other, and right now one has 6 up votes and the other has 10. So really, is this not actually quite a good ELU SE question? As I see it, so far this site has not converged on an answer. There is not agreement or consensus here. This is still literally an open question. How is the goal of SE achieved, and how are future readers best served by closing it so quickly, in this state? I've accepted one answer because it makes the most sense to me, and I think it is correct. The problem seems to be with the shorter definitions relying on the term "unclear" without the context of there being an audio recording in which the spoken words might be unclear, rather than the speaker's meaning. Why must further discussion be prevented? note: There are more comments since this screenshot. I'd welcome additional answers that help me understand why (at least) three other users felt the question should be closed. In some SE sites if the prior research which is already present in the question was considered insufficient, a helpful comment asking for it would have appeared fairly quickly, or at the very least the first close vote would have indicated the proper reason, instead of "has nothing to do with ELL (sic)" in this case, which seems to have served more to mis-direct me than to help me improve the question). Anyway, I will try to look deeper into how to discern between insufficient and sufficient prior research. I'd appreciate any helpful comments about how I could have improved it in this case. Thanks!